The Spot Man is St. Louis’ premier residential and commercial carpet cleaning company, plus so much more! From high-traffic wear to paint drips, wine spills and pet odors, The Spot Man has been beating out the competition with creative cleaning solutions, best-in-industry guarantee and proven customer satisfaction. We welcome you to browse our website and learn more about our cleaning specialties, watch a couple video testimonials, check out our 100% Happiness Guarantee and print your Cleaning Coupons! 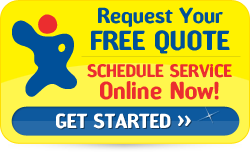 Then, Contact The Spot Man today to schedule your cleaning appointment or to receive a free, no-obligation estimate. We make our clients REALLY happy! From carpet cleaning and tough stain removal to hardwood restoration, see what REAL people are saying about their experience with The Spot Man. They All Said It Couldn’t Be Done! Oops! Accidents happen. From Bleach spots and paint splats to special gifts Sparky leaves behind, The Spot Man has your fix!